April 2016 Public Appeal for Funds- Help Protect our Democratic Right to be GE/GMO free! Global Development and Environment Institute article "Monsanto meets its Match in the birthplace of Maize"
Victory in Vermont, USA- first State to enact Statewide GE food Labelling! Monsanto cooks its own goose - and is protected by the US Government. phenomenal rise in allergies and anaphylaxis in Australia. Are GM foods contributing to the huge rise in food allergies and anaphylaxis? 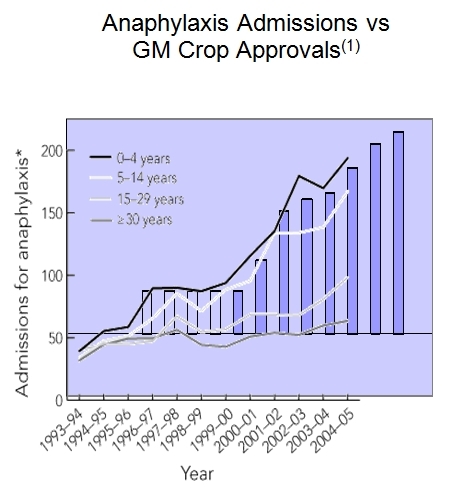 MADGE looked at the approvals of GM foods in Australia and compared them to Australian hospital admission rates for anaphylaxis. Our graph shows a strong correlation between the two. 1. A study predicting that Monsanto’s Roundup Ready canola (GM) could prove allergic to people with sensitivities to red shellfish (prawns, shrimp, lobster). Question: What does so-called 'free trade' have to do with GE? No to GE means No the World Trade Organisation! That was a key message of the protests against the WTO in Sydney this week, although the media seemed determined to keep the actual issues off the front page.